On February 4, 1943, in an American Basketball League game at the Madrid Palestra in Harrisburg, Pennsylvania, Arnold “Red” Auerbach scored 1 point for the home team in a 45-38 loss to the Philadelphia Sphas. It would be the only point in the only professional basketball game he would appear in as a player. As a professional basketball coach, however, he would be on the sidelines for 1,417 regular season and 168 playoff games over a twenty year period. Auerbach’s basketball career started at Eastern High School in Brooklyn were he was an outstanding scholastic player. He received an athletic scholarship to George Washington University where he was a standout player under famed coach Bill Reinhart. Auerbach was deeply influenced by Reinhart’s fast break style of play. Auerbach served in the Navy for three years during World Ward II. While stationed in Norfolk, Virginia he coached the base team. In 1946, Auerbach was hired to coach the Washington Capitols in the newly founded Basketball Association of America. 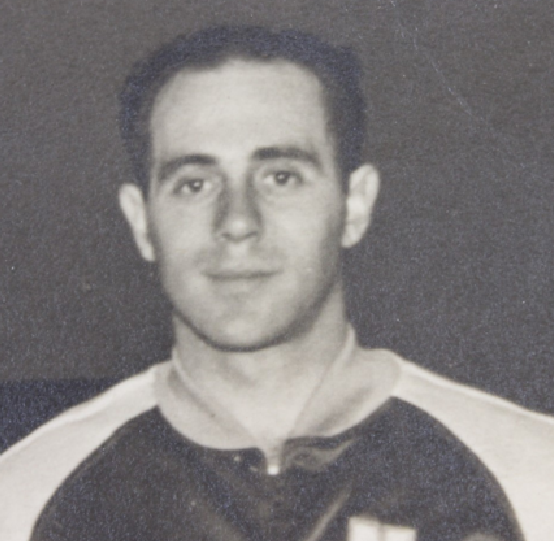 Featuring ex Navy players, Auerbach’s first-year Caps posted a league-best 49-11 record, but were ousted in the first round of the playoffs. It was a pattern that would haunt Auerbach throughout the early years of his career. Auerbach spent two more years in Washington, then coached Tri-Cities for one season, before he landed the job that would make him famous. In 1950, Auerbach was hired to coach the Boston Celtics. Over the next six seasons, Auerbach always produced winning teams, but then failed miserably in the playoffs. Everything changed in 1956 with the arrival of All-American center Bill Russell, a shot blocking defensive wizard, who was the final piece needed to transform the Celtics into the most storied team in the history of professional basketball. Over the next ten seasons, the Celtics won nine NBA Championships. Auerbach resigned as coach after the 1966 Championship finals. He remained active in the affairs of the team as general manager and later as president and vice-chairman until his death in 2006.